Aviation Furniture – Our Airplane Wing Desk is trendy office aviation furniture. It is an ideal airplane furniture piece that will enhance an aviation themed office, or bedroom. The attractive and unique design is based upon our popular Airplane Wing Coffee Table. This office desk will definitely add some great “plane” style to your workplace space. Our Airplane Wing Office Desk is quality built using both MDF, and wood solids, as the wing base. 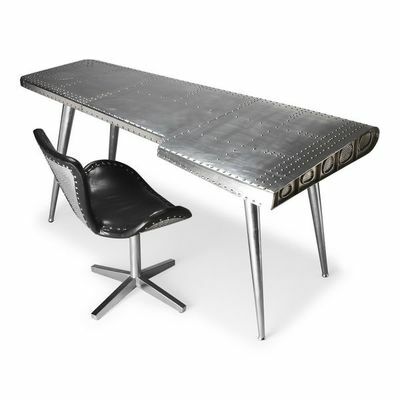 The wood base is then coated with strips of sheet aluminum, and topped with rivets for a totally cool aviation look. The steel legs are then easily attachable to the bottom of the desk.